Plants vs. Zombies - Not Losing Steam?! Still Going Strong! What's the Secret? Based on data gathered by Google Insights for Search from the last 12 months, interest in the keyword related to PopCap's aging Plants vs. Zombies - which translates to interest in the game itself - remains very high worldwide even in the face of serious competition from popular games like Angry Birds and its 3 other versions. 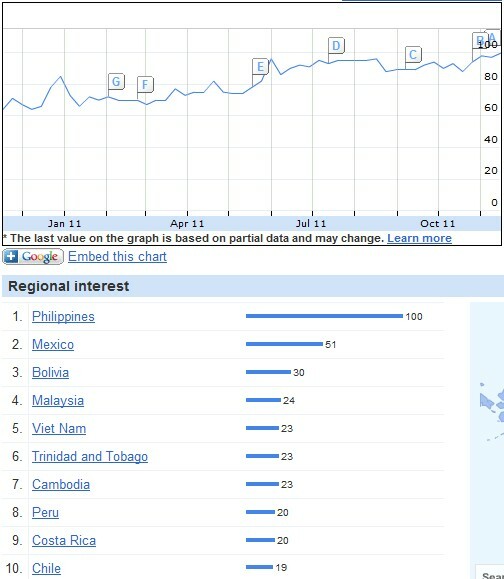 From around 65% interest in the keyword in February 2011, interest in Plants vs. Zombies approaches 95% as of writing. So what's the secret behind Plants vs. Zombies' continuous success? I speculate that it's because of PopCap's early recognition of the growing dominance of mobile platforms like iOS and Android. Plants vs. Zombies is actually in that first batch of PC games to have a version that runs on Apple's iOS for the iPhone, iPod Touch and iPad and on Android. To date, PopCap continues to target mobile platforms that just yesterday, it launched a version of Plants vs. Zombies for Kindle Fire. For the very few who haven't played the game: Download Plants vs. Zombies and if you wish so, learn Plants vs. Zombies Cheats via the links.